We throw a lot of clothing away in the UK. In fact in the year 2006 alone over 800,000 metric tonnes of clothing and shoes were thrown away in the UK. The production, transportation and disposal of our clothes all uses valuable resources. If clothes are just thrown away, they contribute significantly to landfill, and some, such as wool, even release harmful gases as they decay. The best way to get the most wear out of your clothes is to buy clothes that are built to last. Buy the best quality and most well-made clothes you can afford and many items will last you for years. If you’re buying an item to last, buy classic shapes, styles and colours that won’t date too obviously. Cheap high street fashion can be a fun and tempting way to update your wardrobe, but it’s best to try and limit your throwaway fashion purchases to a minimum. Before you throw something away think about if there’s any way you can do it up, modernise it or otherwise revamp it. You’d be surprised at what you can do with a plain boring old T-shirt. Experiment with fabric paints, buttons, ribbon and lace etc. There is quite a fashion these days for DIY chic so you could even try selling some of your creations. 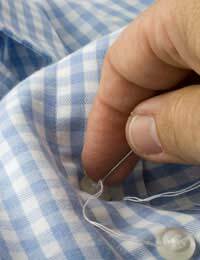 Even if you just know the basics being able to sew can save you a lot of money and waste. With even the most basic sewing skills you’ll be able to fix rips and tears, replace buttons and alter the sizing to fit. With a bit more sewing experience you’ll be able to make your own clothes and re-use vintage and second-hand materials to make new garments. You can use all sorts of fabric such as curtains, sheets, table cloths and fancy scarves. Ask around and look in charity shops and online. If clothes are no longer wearable, cut them up and use them for rags and dish cloths. You can use these for washing up, wiping down surfaces or even cleaning the car. It will save you money on buying cloths as well. You could give clothes to children or schools to use as fancy dress costumes. Children love to dress up and shop-bought costumes can be really expensive. Theatre groups may also find clothes useful, especially if they have a vintage theme or style. Consider holding a clothes swapping party so that you can update your wardrobe and get rid of unwanted clothing at the same time. Our article on Holding a Clothes Swapping Party will give you more information. Vintage clothes are in demand more than ever these days following the fashion for a vintage, shabby chic look. Trendy second-hand clothes shops may be interested in buying any vintage-style clothing and accessories that you have or you could sell them online where there is a very high demand for stylish vintage clothes. Donate clothes that are still in a wearable condition and give them a good clean first. If you have scraps of fabric make fabric flower brooches or use them for collages. Children will enjoy making these things too. If you’re feeling crafty you could use unwearable clothes to make a rag rug. They are easy to make (instructions are readily available on the internet) and make colourful and decorative rugs for your home and are also suitable to give as gifts. You can turn an old pair of jeans or denim skirt into a new handbag easily. Instructions for this craft are also available online and it is fairly easy even for a sewing novice.